"For nearly 100 years, a federal law known as the Jones Act has restricted water transportation of cargo between U.S. ports to ships that are U.S.-owned, U.S.-crewed, U.S.-registered, and U.S.-built. Justified on national security grounds as a means to bolster the U.S. maritime industry, the unsurprising result of this law has been to impose significant costs on the U.S. economy while providing few of the promised benefits. ... While the law’s most direct consequence is to raise transportation costs, which are passed down through supply chains and ultimately reflected in higher retail prices, it generates enormous collateral damage through excessive wear and tear on the country’s infrastructure, time wasted in traffic congestion, and the accumulated health and environmental toll caused by unnecessary carbon emissions and hazardous material spills from trucks and trains. Meanwhile, closer scrutiny finds the law’s national security justification to be unmoored from modern military and technological realities." Thus, the Jones Act made it illegal for any ships that were not "U.S.-owned, U.S.-crewed, U.S.-registered, and U.S.-built" to deliver goods to Puerto Rico after it was pounded by Hurricane Maria. When thinking about the costs of the Jones Act, it's worth remembering that shipbuilding and shipping are examples of US industries that have been dramatically protected from foreign competition for nearly a century. If susttained protection from foreign competition was a useful path to the highest levels of efficiency and cost-effectiveness, then US ship-building and shipping should be elite industries. But in fact, US ship-building and shipping--safely protected from competition-- have fallen far behind foreign competition, with negative costs and consequences that echo through the rest of the US economy--and probably diminish US national security, too. As a starting point, less competition means less pressure to seek out efficiency gains. After nearly a century of protection from foreign competition, costs of ship-building in the US are far above the international competition. "Absent competitive forces, the U.S. shipbuilding industry has not felt compelled to evolve and similarly find its own competitive niche. Instead, it produces numerous types of vessels for which it possesses no particular advantages compared to foreign sources, and at a much higher cost. ... This mediocrity is further confirmed by the absence of foreign demand for U.S. ships. Exports from the sector, including repair services, accounted for a mere 4.6 percent of the industry’s revenue in 2014." The cost of shipping between US ports, including both the cost of ships themselves and the other costs, are also far above international levels. "For reference, within the continental United States, moving crude oil from the Gulf Coast to the Northeast on a Jones Act tanker costs $5 to $6 per barrel, but only $2 per barrel when it is shipped from the Gulf Coast to Eastern Canada on a foreign-flagged vessel. ... The Jones Act also explains the seemingly curious sourcing decisions for other commodities, such as rock salt. Maryland and Virginia, for example, obtain the product for wintertime use from distant Chile instead of domestically, despite the United States being the world’s largest producer of that commodity." "In 2015 the Maritime Administration listed the number of active shipyards at 124 but also pointed out that, of those, only 22 are `mid-sized to large shipyards capable of building naval ships and submarines, oceangoing cargo ships, drilling rigs and high-value, high-complexity mid-sized vessels.' This pales in comparison to shipyards in Asia. Japan, for instance, currently has more than 1,000 shipyards, and it is estimated that China has more than 2,000. There are also only 7 active major shipbuilding yards in the United States, as compared to roughly 60 major shipyards in Europe (major shipyards are defined as those producing ships longer than 150 meters). 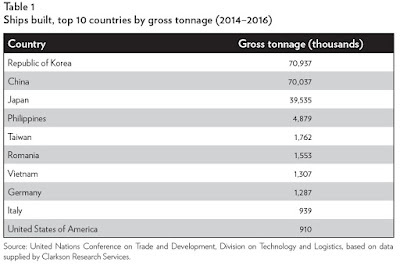 Table 1 presents the top 10 countries for the total number of ships built in gross tons during 2014–2016. At under 1 million gross tons, U.S. shipbuilders’ output was less than 1 percent of China’s and Korea’s shipbuilders." Also, with high costs of ships and shipping, the amount of freight that travels by water is low in the US, and declining, while in other places is it much higher and rising. "Although 38 states and the District of Columbia are connected by navigable waterways and marine highways, and nearly 40 percent of the U.S. population lives in coastal counties, coastal shipping of cargo between U.S. ports in the Lower 48 states comprises a negligible 2 percent of domestic freight. ... In the European Union, where cabotage among the member states is permitted, the corresponding figure is 40 percent. In Australia, where vessels need not be built domestically to participate in cabotage services, coastal shipping accounts for 15 percent of domestic freight. Meanwhile, after relaxing its cabotage restrictions in 1994, New Zealand experienced a decrease of approximately 20–25 percent in coastal freight rates over the subsequent six years." Unsurprisingly, the high cost of shipping by water means that in the US, freight is instead shipped overland . Consider, for example, all the trucks and trains that run up and down the east coast or the west coast. "[A]ccording to the Congressional Research Service, “some of the most congested truck routes, such as Interstate 95 in the East and Interstate 5 in the West, run parallel to coastal shipping routes, and water shipment through the Saint Lawrence Seaway and the Great Lakes has the potential to relieve pressure on major east–west highways, pipelines, and railroads in the Midwest.”"
"According to the World Shipping Council, maritime shipping `is the world’s most carbon-efficient form of transporting goods—far more efficient than road or air transport.' Maritime shipping produces approximately 10–40 grams of carbon dioxide to carry one ton of cargo one kilometer. In contrast, rail transport produces 20–150 grams, and trucking—whose tonnage is forecast to grow 44 percent by 2045 according to the Department of Transportation—produces 60–150 grams. " "Of the 46 ships comprising the Maritime Administration’s Ready Reserve Force—a fleet that helps transport combat equipment and supplies `during the critical surge period before commercial ships can be marshaled'—30 are foreign-built. Although worthy to serve in the country’s defense, these same ships are ineligible to engage in coastwise trade." As a general rule, it is unlikely that the solution for a problem is identical to the cause of the problem. But after nearly a century of protection from international competition sheltered US ship-building and shipping to compete with foreign competition and thus led it into near-obsolescence, the reason for keeping the Jones Act in place seems to be that, without it, the US shipping and ship-building industry would have a hard time competing. It's a little like arguing that the cure for a drug addition is a continuing supply of the drug to which you are addicted. I'm willing to have a discussion about what policy steps might be useful in creating a US ship-building and shipping industry that is internationally competitive. The necessary steps might be dramatic and costly. But the first step in that discussion is the acknowledgement that the long-run effects of the Jones Act have been terrible and counterproductive policy for the US shipbuilding and shipping industries. It has rendered those industries essentially unable to compete on the world stage, while creating costs throughout the rest of the US economy and reducing US military security. Any plan for US shipbuilding and shipping which doesn't focus on how to bring the Jones Act to an end is not serious.